The Romans lived in a wide variety of homes depending on whether they were wealthy or poor. The poor lived in cramped apartments in the cities or in small shacks in the country. The rich lived in private homes in the city or large villas in the country. Most people in the cities of Ancient Rome lived in apartments called insulae. The wealthy lived in single family homes called domus of various sizes depending on how rich they were. The vast majority of the people living in Roman cities lived in cramped apartment buildings called insulae. Insulae were generally three to five stories high and housed from 30 to 50 people. The individual apartments usually consisted of two small rooms. 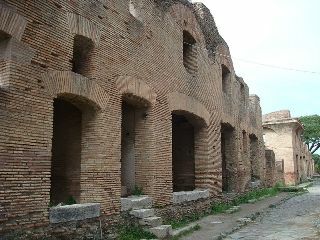 The bottom floor of the insulae often housed shops and stores that opened out to the streets. The larger apartments were also near the bottom with the smallest at the top. Many insulae were not constructed very well. They could be dangerous places if they caught fire and sometimes even collapsed. The wealthy elite lived in large single family homes called domus. These homes were much nicer than the insulae. Most Roman houses had similar features and rooms. There was an entryway that led to the main area of the house called the atrium. Other rooms such as bedrooms, dining room, and kitchen might be off to the sides of the atrium. Beyond the atrium was the office. In the back of the home was often an open garden. Vestibulum - A grand entrance hall to the house. On either side of the entrance hall might be rooms that housed small shops opening out to the street. Atrium - An open room where guests were greeted. The atrium typically had an open roof and a small pool that was used to collect water. Tablinum - The office or living room for the man of the house. Triclinium - The dining room. This was often the most impressive and decorated room of the house in order to impress guests that were dining over. While the poor and the slaves lived in small shacks or cottages in the countryside, the wealthy lived in large expansive homes called villas. The Roman villa of a wealthy Roman family was often much larger and more comfortable than their city home. They had multiple rooms including servants' quarters, courtyards, baths, pools, storage rooms, exercise rooms, and gardens. They also had modern comforts such as indoor plumbing and heated floors. The word "insulae" means "islands" in Latin. 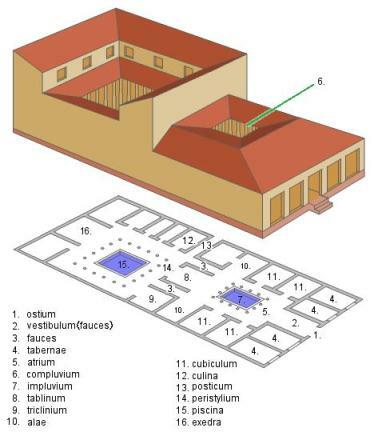 The entrance to a Roman house was called the ostium. It included the door and the doorway. Fine Roman homes were built with stone, plaster, and brick. They had tiled roofs. A "villa ubana" was a villa that was fairly close to Rome and could be visited often. A "villa rustica" was a villa that was a far distance from Rome and was only visited seasonally. Wealthy Romans decorated their homes with murals, paintings, sculptures, and tile mosaics.